Today’s Young Guns segment features a bjj practitioner from a distant part of the world where martial arts has historically been a striker’s art form. In a country where a modest youth can change himself to an international superstar, today’s Young Gun, Ralph Go is trying to replicate Manny Pacquiao’s success with boxing in BJJ. Ralph Go, a brown belt under Makoto Aramaki, is one of the foremost competitors coming out of the South East Asian BJJ scene today. 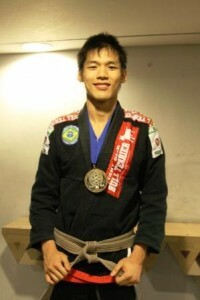 This young competitor started his BJJ career by watching video tapes and training with friends. As he grew in the sport, so did his insatiable thirst to learn more; therefore, he decided to drink straight from the well. As a member of Team VPF/Atos, Ralph Go splits his time between the Philippines, Brazil and the US. At the 2011 Mundials, Go lost in the finals to a gamed Jordon Schultz… Not bad for a kid who started BJJ by watching video tapes. 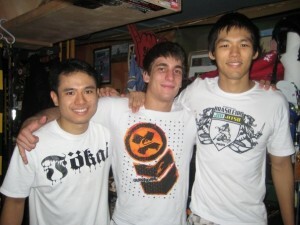 Enjoy the interview courtesy for BJJ Asia (http://www.bjj-asia.com/2009/12/interview-w-ralph-go.html)! BJJ Asia: For those that aren’t familiar with who you are, please share with us a bit of your BJJ history. How and when did you get starting in BJJ and where did you receive your initial instruction/promotions? Ralph Go: My name is Ralph Go, I started BJJ in late 2003 with Ali Sulit. He was my original instructor and he is responsible for the structure of the team we have today. Before we used to be an affiliate of New Breed Academy based in California under John Ouano and Myles Vives. I received my blue and purple belt under John Ouano and brown under Makoto Aramaki, unfortunately due to lingering internal problems that we were unsatisfied with for quite some time, we decided to go our separate ways from Newbreed to form VPF here in the Philippines. Now VPF here in the Philippines is affiliated with Atos of Brazil. BJJ Asia: Coming up in the Philippines, how have you kept so focused especially when access to higher belts/black-belt instructors was very limited? RG: Before when we started we were all white belts, even Ali was a white belt. Very rarely a colored belt would to come to train since we only trained at an affiliate gym which was outside of the main branch in the Philippines. I relied a lot on video instruction to help me learn BJJ. However, in my opinion this can only get you so far. It made us very hungry to learn BJJ and it had me go toJapan, Guam, US, Brazil to learn. BJJ Asia: What kind of advice would you give to those in similar situations where the instruction is not ideal? RG: Keep traveling, learning and competing. I have seen many people be contented to what level they have achieved and just stop progressing. I have seen many people with alot of talent but no dedication just fade away and stopped training. If you have alot of dedication and passion for what you do you attract other people like you towards you that can help you. BJJ Asia: Perhaps one of the most decorated competitors from the SEABJJ scene, what aspect of jiu-jitsu do you see playing a larger role in your training, sport or martial art? Do you separate the two or do they go hand-in-hand? RG: In my opinion they go hand in hand. My primary goal is to win competitions and reach the rank of black belt. Outside of the competition areas, my objective is to be a good individual, someone other people can recognize for honesty and good conduct. BJJ Asia: How does this focus translate to what gets taught to your students at VPF/Atos? RG: We are what we do repeatedly; success is the constant practice of winning actions and fundamentals. There is no luck or miracles involved nothing of that sort. BJJ Asia: This year has been quite busy for you having taken several months out of the year to travel to Brazil and US to train/compete. What was the experience like for you as a student in the birthplace of BJJ? How was it competing in Brazil? RG: It was an awesome experience, sometimes it feels like a dream. Something you ask yourself like did that really happen? Or am I watching a video or am I really here? It was really hard at the same time. The training schedule we had we were training 3-4X a day in the middle of nowhere. No beach, the restaurants closed at night/weekends, basically not doing anything but bjj! Many people say it’s actually not the typical Brazil experience that other people have. You really have to love bjj to get through that, training that much really takes its toll mentally and on the body too! Competing in Brazil is a definitely at a very high level, the brown belts winning my category would definitely give high level black belts a lot of trouble somewhere else. BJJ Asia: Who do you train with when you are in Brazil? RG: I spent a few weeks visiting Rio de janeiro and training at Checkmat, but for the most part I spent training in Rio Claro, a small town outside of Sao Paulo. Here was the homebase of Atos BJJ. Everyday I trained with Rafael Mendes, Bruno Frazzatto, Guilherme Mendes, Guto Campos, Claudio Calasans, Gilbert Durinho 3x a day. They have also some monster guys at lower belts. They have blue belts that would totally kill alot of black belts and brown belts it was ridiculous already. BJJ Asia: From your experience training in Brazil, what would you like to bring back to SEABJJ in terms of training/mindset/technique? RG: I was able to see first hand why everyone was so good. Everyone had the mindset that the one who trains the most will win, and every one reaps what they sow. Hence they train 3-4x a day. I thought I was training a lot before I went to Brazil but now I realize I wasn’t doing anything! Everyone showed a lot of dedication and will to succeed that I haven’t seen anywhere else. There really isn’t any secret formula, all the best guys train a lot. BJJ Asia: Unfortunately you were injured just before the Mundials. How did you cope with not being able to compete after so much preparation? RG: Yes, unfortunately I got injured during one of the last training days before going to Mundials so I had to sit out and just watch. I was disappointed but some things I believe are blessings in disguise, many things I thought I knew about jiu jitsu I had to totally change when in Brazil. My mind was so overloaded with things I felt that I needed some time to adapt to the things I learned first. BJJ Asia: You’re most recent victory came two-fold at this year’s Tokyo Open having taken your weight division and the absolute. Could you walk us through your weekend and a few or you matches? Do you feel this victory is a turning point in your game or is it just another part of the process? RG: Actually I didn’t take my weight division, I lost first round by advantage in the lightweight brown division. I was very disappointed but I was able to enter the 2nd day with a lot more will to win and thank God I arrived as champion. I submitted all my opponents except the final of the absolute. I was very happy I was able to implement the things I trained for. However still so many mistakes and things to improve. I’d like to continue to compete in big tournaments to improve such as Europeans, PAN, Abu Dhabi Pro trials, Rickson Cup, Asian Open, Mundials, Brasiliero next year but being limited by budget I can only focus on a few. BJJ Asia: VPF has just recently become an affiliate of Atos JJ, one of the newest teams winning gold at the highest level with Ramon Lemos and Andre Galvao as leaders. What does this affiliation mean for the team in Philippines and what changes do you see coming in the new year? RG: Definitely, we are very happy with this opportunity. You can expect the level of Philippine BJJ to go up. Many fellow BJJ practitioners here in the Philippines has recognized our work in VPF and now are training together with us as one team. This happening and the affiliation with Atos what was impossible before, is now possible for us. BJJ Asia: We would like to thank you for taking the time to chat with us. Is there anything you’d like to share with the readers? RG: Thanks Luke! I’d like to leave a message to the readers always come to academy to train, depending on how many times you can train or your schedule permits. Always try to come to the maximum of your abilities. What we do repeatedly defines who we are!